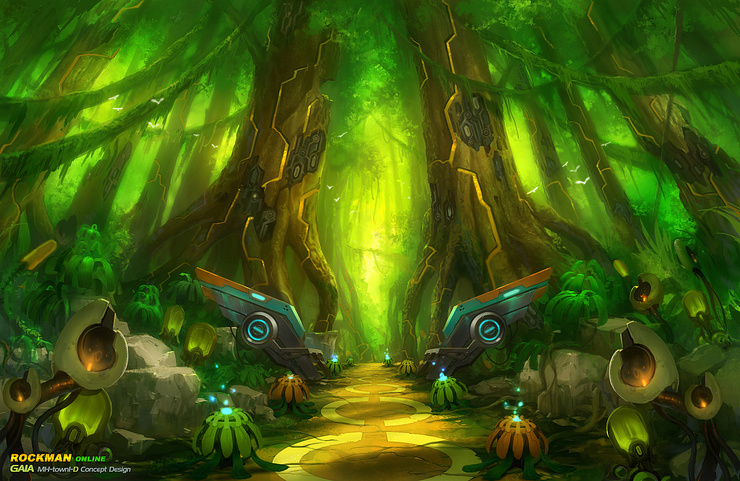 The official Rockman Online blog has updated once again with details on a new environment: the Kronos Forest (pictured). The artificial fortress was once under the control of the UCA but has recently been seized under the URA's influence. Those who enter the forest are attacked by a seemingly invisible foe, Sting Chameleon if the silhouette on the blog is any indication. Despite the dangers of the forest, the UCA is preparing to take back the Kronos and the survivors who may reside within its domain. In related news, it appears NeoWiz are done with the easing; come mid-November, the developer will finally reveal Rockman Online at gaming trade show G-Star 2010. From November 18 through the 21st, the event in Seoul, South Korea, will play host to a public playable version of Rockman Online. Footage of the game in action is expected, so be on the lookout for the inevitable gameplay videos around then. If you plan on attending, we'd greatly appreciate your own videos and impressions so please do send those my way! So, they're finally going to show some gameplay, huh? Well, it's about time. It certainly took them long enough. When that time comes, here's hoping they won't disappoint. I'll see if I can attend the event on the 21st. Unlikely though, what with me being busy.